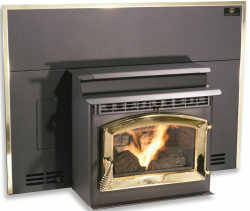 The Breckwell P23 is supplied as the basic insert unit. You decide whether to specify a pedestal base or the leg option. The legs come in either gold, nickel or black. The P23 has the stepped top design to increase its hopper capacity, which is 60 lbs. and allows the stove to burn for up to 60 hrs. Maximum output is 47,000 btu. See comments below. 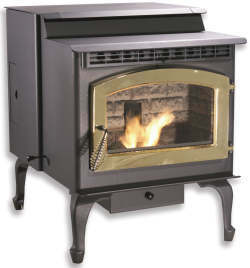 The P23 has a large ash pan for a stove of this size, it is recommended to be emptied only after burning a ton of fuel. See comments below. Max. Heat Output 47,000 btu. Weight 240 lbs. Pedestal +40 lbs. Legs +13 lbs. Window Size 14 in. by 9 in. Rear Vent Height Freestanding 10.75 in. Insert 2,2 in. Height 30 or 32 in. Width 42 in. It's recommended that the Breckwell P23 not be run for more than one or two hours at a time on the high heat setting to prevent damage. If you would like to leave a review of the Breckwell P23 pellet stove or fireplace insert, please use the form on the contact page.